Idol actor Jang Geun Suk took a commemorative photo next to his endorsed advertisement, attracting a lot of attention. On May 11th, 2012, Jang Geun Suk tweeted on his personal Twitter account, “The encounter of Jang Geun Suk and Seo Joon,” and uploaded a photo. 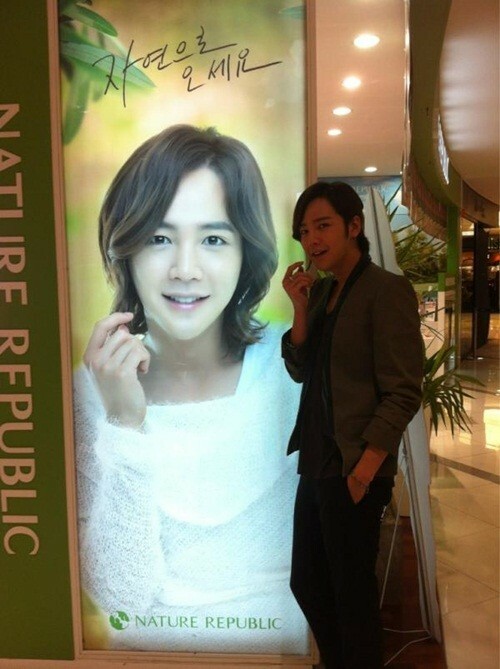 In the photo, Jang Geun Suk stood in front of billboard of cosmetics brand he endorsed. In particular, Jang Geun Suk was imitating the posture and expression of himself on the advertisement, fully of cuteness, provoking a lot of laughter. Netizens who saw the photos commented, “Jang Geun Suk is handsome, Seo Joon is also handsome,” “The look of full of mischievous is very cute” and so on. In addition, Jang Geun Suk is currently starring in KBS2 drama “Love Rain” in the role of Seo Joon.